My husband and I pray about everything in our kids’ lives, from their health and safety to their schools and yes, even their friends. While we understand that we cannot choose all the people our children surround themselves with as they get older, it doesn’t lessen our desire for them to have fulfilling relationships. I dare say that our children will even focus more of their energy and mind on the people they go to school with then what they are actually learning in school. And if you’ve ever had a conversation with your kids while they sit in the backseat of your car about how school was that day, I bet one of the first things they talked about was their friends and how they treated each other. 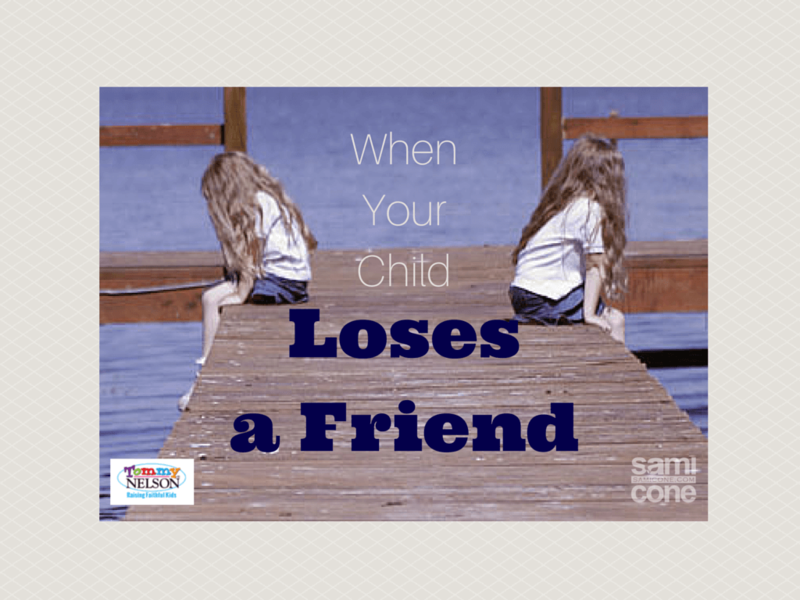 While not having friends can be a difficult journey to walk through with your child, perhaps even more difficult is when your child loses a friend. 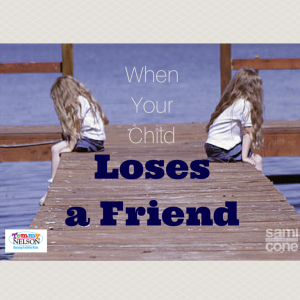 This can happen for several reasons, but the most common is when your child’s friend simply stops being their friend one day with no further explanation. Unlike a friend that moves away or goes to another school, a friend that simply stops talking to or playing with your child hurts them to the core. They are left wondering what they did wrong and what they can do to earn that friendship back, even if it’s not the healthiest relationship. And the age of your child doesn’t seem to matter; the hurt is equally great weather we’re talking about preschoolers or graduating seniors. The most recent time this happened to my daughter was especially painful. This was a newer friend that our daughter had befriended on the first day of school because she was the new girl. I was so proud of our daughter for taking this new student under her wing, especially since my daughter had been the new girl in school last year. But after Christmas break, my daughter’s friend returned to school with a new phone and promptly found a new group of friends who also had the means of communicating electronically. We did everything we could do within ourselves: we talked with her teacher as well as the school counselor, and my daughter even asked her friend point-blank, “Are you mad at me?”. Unfortunately, not only did this not resolve the situation, it didn’t heal the deep hurt inside my daughter. As a parent, my next reaction turned out to be a mistake. Instead of recognizing the hurt within her and allowing her a chance to grieve the loss, I went the route of, “it wasn’t meant to be, you don’t need friends like that anyway”. Just like we so often do as married couples, I tried to fix the situation instead of feel the situation. Don’t get me wrong, I’m not saying there isn’t a teachable moment in there somewhere. But when emotions are at a high, our wisdom retention is at a low. if a foe were rising against me,I could hide. So while I don’t wish this situation upon any of you as parents, unfortunately the odds are that each of us will find ourselves in this situation at least once in our parenting careers. So if I can encourage you with anything from my personal experience, it would be simply to be there for your child, speak less, listen more, and love well. Have you ever walked a similar road with any of your children? If so, how have you handled it? This entry was posted in Blog by Sami Cone. Bookmark the permalink.